My husband and I really enjoy our trips to England. 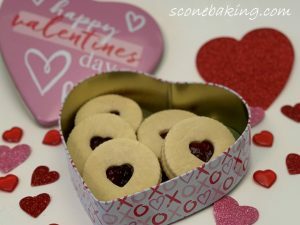 So, for Valentine’s Day I decided to make my darling husband (my sweetheart), Jammie Dodgers. For those in the United States, a Jammie Dodger is one of England’s favorite biscuit (cookie). 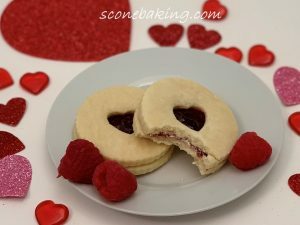 It’s a shortbread sandwich cookie filled with a splat of raspberry jam, and a heart-shaped center. These cookies are named after The Beano comic character, Roger the Dodger who is always getting into sticky jams. This is a simple shortbread cookie that you and your kids will enjoy making, eating, and sharing. Grate cold butter in large bowl; add flour. Using your fingers rub together butter and flour until breadcrumb texture, about 2-5 minutes. Add sifted powdered sugar; mix thoroughly using a spatula. In a small bowl whisk together egg yolk and vanilla extract; stir into flour mixture until it starts clumping together, this may take 2-5 minutes. Turn out onto a lightly floured board, knead it a couple of times to make a ball. Roll out dough on some cling film (seran wrap), with a layer of cling film on top to 5mm (about 1/4″) thickness and smooth. Place in fridge for 30 minutes. Remove top cling film (seran wrap), using a 58 mm (about 2-1/4″) round-fluted cutter, cut out as many cookies as you can (re-roll and cut dough until it’s all used). 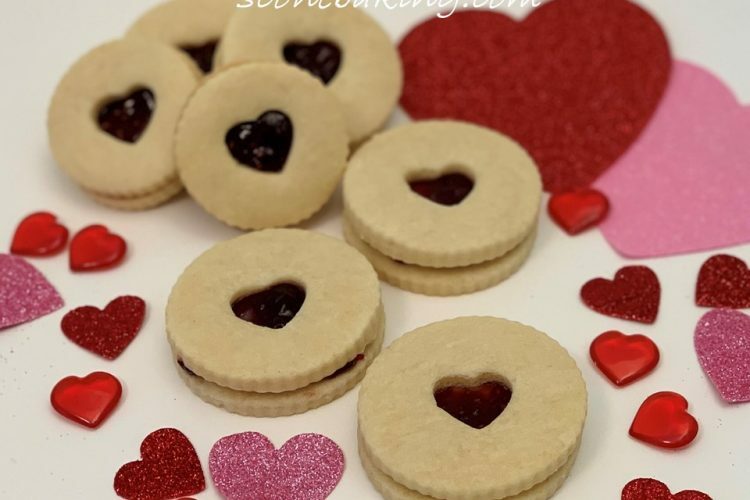 Using a very small heart-shaped cookie cutter, cut-out a heart-shaped hole in the middle of half of your cookies (this will be the top cookie of your Jammie Dodgers). Place the cookies on a parchment-lined baking sheet, place in the fridge to chill for 5 minutes. Preheat the oven to 350-degrees F. Bake chilled cookies 10-15, the tops should still be pale. Remove cookies with parchment onto cooling rack. If the heart-shaped hole has closed up a bit, re-cut it as soon as the cookies are removed from the oven, to give the cookies a clean cut. Cool completely. Spread on 1 tsp. 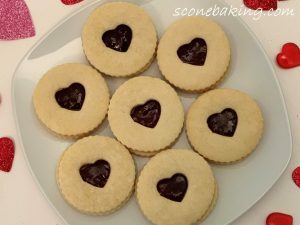 of raspberry jam on each cookie without the heart hole, ; top each with a heart-shaped hole cookie (it’s okay if some of the jam comes up through the hole). Chill cookies in the fridge for at least 1 hour (they’re even better the next day). Enjoy! 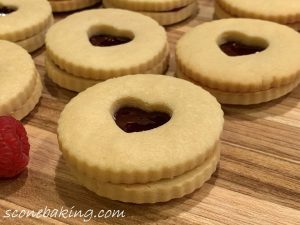 Click on the link below for my YouTube video demonstrating how to make these delicious Jammie Dodgers.